Normally when we go out on our MAPS visits I try to remember to take a deerfly patch, a sticky piece of tape that affixes to the back of your hat and traps the deerflies when they land on your head. This weekend, when we visited Rock Ridge, I forgot to grab one. I figured I was in for a long day of tolerating deerflies, but I discovered I had some unexpected help. As I walked along the paths, dragonflies would leave their perches and zip up to snag one of the circling (and somewhat oblivious, it seems) deerflies out of the air from beside my head. 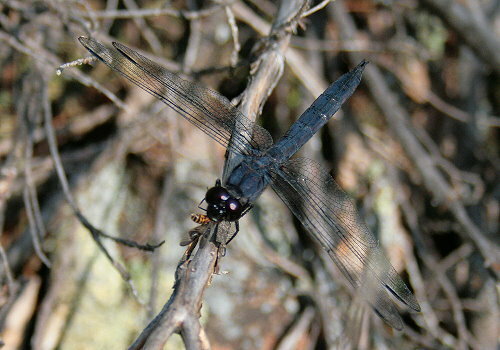 It was neat to hear the rustling of dragonfly wings as they darted by my ear. I didn’t think to keep count, but there were probably a dozen dragonflies that swept by and snatched a deerfly from the crowd about my head. Above is an Eastern Pondhawk, Erythemis simplicicollis, and below a Slaty Skimmer, Libellula incesta, enjoying their freshly caught meals. These photos are just AMAZING! 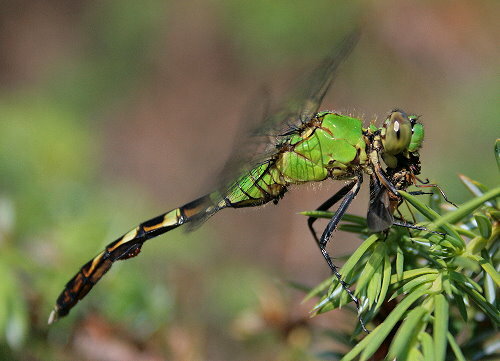 It’s hard enough to capture images of the ever-zooming dragonflies, but to find them noshing down on their prey — what a feat! But then, i suppose they do sit still to enjoy their meals. I’ve heard of tethering Praying Mantises to the bedpost so they’d grab the mosquitoes at night. Maybe you could devise little harnesses to tether dragonflies to your hat.